LDCO800: The energy-efficient, DC-powered operator that runs at an AC-equivalent speed. DC drive motor with soft-start and soft-stop for smooth, quiet, long-term reliable performance. Optional Battery Backup available for added peace of mind. 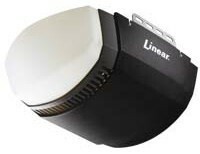 LDO33: Single-lamp 1/3 HP residential garage door operator compatible with belt & chain drive rails. LSO50: Dual-lamp 1/2 HP residential garage door operator with superior vibration isolation mounting brackets and noise dampening acoustical foam, compatible with belt & chain drive rails. 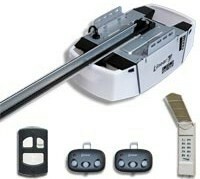 LSO50-2T: Dual-lamp 1/2 HP residential garage door operator with vibration isolation mounting brackets, installer kit, includes HBT7C 7-foot belt drive rail, two MCT-3 transmitters, and one MDTK keypad transmitter. 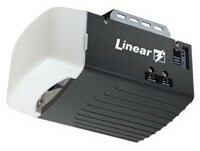 LCO75: The Model LCO75 3/4 HP Deluxe Dual Lamp Garage Door Operator is Linear’s most powerful door operator yet. It can be used in light-duty commercial installations or in residential applications with heavy carriage house style garage doors.